With Atlantic salmon there are males, there are females ... and then there are the other males, so different from the "standard" males that only an expert would recognize them. Every summer, tens of thousands of immature male salmon in the Connecticut River watershed will "choose" between the two dramatically different paths. Their choice won't be a conscious one, of course, but one determined by the interplay between genes and environment. The broad outlines of Atlantic salmon biology are pretty widely known. They lay eggs in streams. Young salmon migrate to the ocean and grow rapidly. Eventually, they return to start the cycle over again. We've all seen photos of majestic salmon leaping small rapids with a single bound in a determined effort to return to the stream of their birth. This story fits virtually all female Atlantic salmon, and some male salmon as well. But there is another story, far less well known. It turns out that some males, in fact, most males, skip the whole ocean-going routine entirely. The standard life history is a risky one. The vast majority of salmon hatchlings don't survive the first few weeks of life, serving as food for all kinds of stream predators. Those baby salmon that do survive feed on insects and other invertebrates that drift down the stream currents. By the summer of their first year, they are about three or four inches long, and are called "parr." Most of them will continue feeding and growing until their second winter. 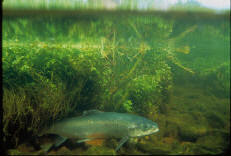 During that winter, the young salmon undergo a dramatic change. Their coloring shifts from darkly striped to silvery. In the early spring, they drift downstream and their body chemistry changes from that of a freshwater to that of a saltwater fish. In April or early May, these "smolts" leave the river and enter the ocean. The ocean is also a dangerous place for salmon. Only about six inches long, salmon smolts are the perfect sized meal for many ocean predators. Striped bass, for example, hang around in the lower Connecticut River every spring, feeding with gusto on young salmon. Those smolts that make it through the Striped Bass gauntlet eventually join Atlantic salmon from all over the North Atlantic to feed on fish, squid, and small crustaceans in the ocean south of Greenland. By their fifth spring, the salmon are typically thirty inches long and ten pounds. At this point, those salmon that haven't been caught by the international swarm of fishing boats plying the North Atlantic, only a minute fraction of those that hatched four years earlier, find their way back to the river of their birth. There they wait patiently, without eating, until late November or early December when they mate and lay eggs and begin the cycle again. But what about the other males? After their first summer, when they are still only about six inches long, they don't grow much at all. They retain the dark vertical stripes and trout-like appearance of immature parr salmon. But they become fully sexually mature. That's why they are called "precocious males." Their appearance is so different from that of ocean-going male salmon they were once thought to be a kind of river-resident trout. When late fall arrives and female salmon begin to scoop out their nests, the most dominant of the large ocean-going males try to keep other males from fertilizing the eggs. A dominant male can fertilize tens of thousands of eggs from several females. Because there is such a great benefit in being the dominant male, the large ocean-going males are constantly jockeying for position in the hierarchy -- and size usually wins. So where does this leave the tiny, "precocious" males? Barely one hundredth the weight of one of the ocean-going males, precocious males don't stand a chance in any dominance contest. But while dominant males are fighting off rivals, precocious males will dart out from behind rocks and shallow water and "sneak" in to fertilize as many eggs as they can before racing back to safety. Precocious males give up the benefits of ocean-attained size for the relative safety of streams and a greater possibility of survival to have a chance to fertilize a smaller percentage of the eggs. In the end, enough of these small males fertilize enough eggs to pass on the genes that keep this life history common. Enough large males survive the ocean-feeding stage and return to dominate spawning sites to keep that tactic common as well. Virtually all females, on the other hand, go to sea. Maturing as a small precocious female probably doesn't work because salmon lay relatively large eggs and the number of eggs a female can lay is heavily dependent on her size. A female's best chance of leaving offspring is to take the risks at sea and hope to grow large enough to lay thousands of eggs. Because sperm are tiny and numerous, even a small precocious male, if he's in the right place at the right time, can fertilize hundreds or even thousands of eggs. All male salmon start out with the potential to use either tactic. The "decision" to adopt one or the other seems to be based on growth rate. If an immature salmon grows rapidly, either because it has a prime feeding spot, it hatched in an unusually productive year, or it is in a warm location, it will mature early and take its chances as a "sneaker" male in the fall. If not, it will hold off on maturing and take its chances in the ocean, with the hope of returning as a large, dominant male a couple of years later. The threshold for determining whether a fish's growth rate is high "enough" to go the precocious male route is coded in the salmon's genes. In a natural system, the number of immature salmon choosing one tactic or the other fluctuates each year, creating a shifting balance over time. The changes humanity has brought to the Connecticut River have distorted this delicate balance, however. By about 1800, dams built for mills and power blocked the return of Connecticut River salmon from the ocean and caused the extinction of this population. The collapse of some dams and the construction of fish ladders and lifts made a restoration effort feasible in the late 1960s. Using wild salmon from Canada and Maine, this program has restored a small run of a couple hundred salmon to the River. All the salmon that return from the ocean each spring are caught at the fish lift at the dam in Holyoke, Massachusetts. Ninety percent are retained to be bred at the Cronin National Salmon Station run by the U.S. Fish and Wildlife Service in Sunderland, MA. Their fry are later released in nearly all the tributaries of the Connecticut. The other ten percent of the returning salmon are released above the Holyoke Dam, where they continue their migration, over fish ladders, and back to the streams where they hatched. Between the small number of naturally spawning salmon and the 8 million or so fry stocked by the restoration program, there are millions of male salmon fry in the Connecticut River watershed these days. And here at the southern end of the Atlantic salmon's range, growth rates are usually high due to ample food, light, and warmth. This means that over the next few weeks, most of those immature salmon will "choose" the precocious male tactic. In fact, in many streams, the number of male salmon choosing the precocious male tactic is nearly 100 percent. Unfortunately, the overwhelming majority of those tiny males will be waiting this fall for a chance to breed that will never come. Remember that all but 10 percent of the few hundred salmon that return to the Connecticut each year are retained for the hatchery effort. Very, very few females make it back to streams to breed naturally. Until the restoration effort succeeds in increasing the number of ocean-returning females, there will be a lot of frustrated precocious males. And if salmon could regret, a lot of them will regret that they didn't make the choice to take their chances on the open seas.